GEORGE TOWN: In 2005, the house located at a seaside village in Teluk Bahang served as a shelter for just 10 stray cats rescued from the streets. Today, the Pantai Kucing or 'Cat Beach' is home to about 200 stray felines. The shelter is managed by fisherman, Nana Wan Chik, 57, and business partner from New York, Teviot Fairservis, 62, a non-profit management consultant. With feline grace, the local man and the American woman are dedicated to looking after the cats with an energy that is simply boundless. Nana, better known as 'Papa Kucing' said he initially housed 10 cats rescued from the roadside. However, the number increased over the years. "After I set up this place and called it 'Cat Beach', word got around and some of the people sent cats here. Now, there are about 200 cats under our care," he told Bernama in an interview recently. However, the father of the four had to decline additional cats sent to the shelter due to financial constraints and health factor. He said it was not easy caring for the over 200 cats as they needed adequate food and medicines. "Recently, a woman from Kulim, Kedah wanted to send over 100 cats to this place but I had to decline as we can't afford it. "Luckily, my sister helps out feeding the cats with leftover rice and food from the school canteen, apart from contributions from individuals," said 'Papa Kuching'. Meanwhile, Fairservis said they needed funds to cater to the needs of the cats as they currently only relied on fundraising and donations from individuals and non-governmental organisations. "I am not a crazy cat lady, but I am a very experienced fundraiser and non-profit management consultant, so I thought whatever reason that brought me here, I chose to be here and I could use my skills to help the cats. "It is a sanctuary (for cats) and not yet a professional shelter. With more funds and veterinary care, we will get to that point. It will need many volunteers and a lot of help, though," she added. 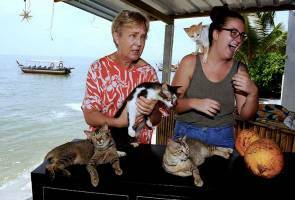 Fairservis said she wanted to turn 'Cat Beach' into, not only a cat shelter but also a place that could educate the people to love animals. Currently, the shelter has two live-in volunteers, as well as foreigners who visited Penang for a holiday and decided to assist in maintaining the place. "We hope to encourage volunteers to stay here because we also provide accommodation. For now, people can visit this place for free, but we are looking to charge admission fee for visitors, perhaps at RM10 per entry," said Fairservis. She said people interested in contributing could visit the websites www.paypal.me/TeviotCatBeachPenang or www.gofundme.com/catloversintl.